Essential Question – I like to revisit the essential question at the beginning and end of each lesson throughout the week, so that, students can see how everything that we do is to answer this question. Common Core Standard – As students try to answer the question, they are developing skills related to mastering a Common Core standard. In Math, we dedicate one week per standard. In Social Studies, students will develop skills related to a Reading and Writing standard. I require students to write the code and student-friendly wording. For example: 7.NS.A.2 Multiply and divide rational numbers. 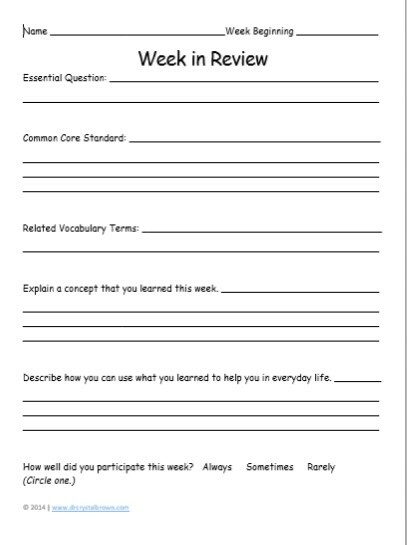 Related Vocabulary Terms – Students should list the words that at hey learned this week or words that were pertinent to them answering the essential question or developing skills related to the standard. Learned Concept – Students have to explain one concept that they learned from the week’s activities. Real World Application – Throughout the week, students will partake in activities that are related to real world scenarios. The Week in Review makes sure students make those connections from the activities to the real world. Lastly, I want students to reflect on how much they participated throughout the week by rating themselves.